Product prices and availability are accurate as of 2019-04-11 11:34:16 EDT and are subject to change. Any price and availability information displayed on http://www.amazon.com/ at the time of purchase will apply to the purchase of this product. The A330 is a wide-body twin-engine jet airliner made by Airbus. The A330 was developed in parallel with the A340, which shared many common airframe components but differed in number of engines. Both airliners incorporated fly-by-wire flight control technology and six-display glass cockpit, first introduced on the A320 aircraft. 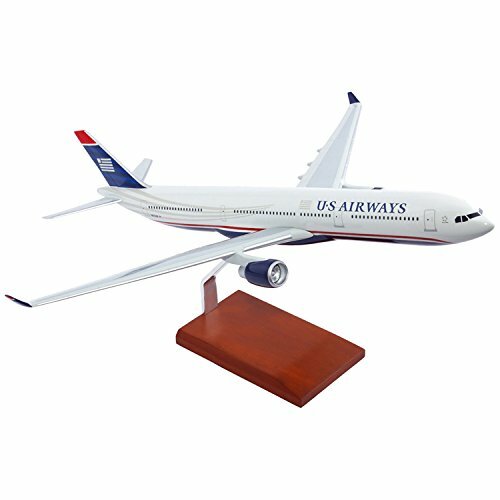 This specific model is the A330-300, which is the first variant. The -300 took its maiden flight in November 1992 and entered passenger service with Air Inter in January 1994.This specific model is painted in the US Airways paint scheme. US Airways is a major U.S. airline based in Tempe, AZ. The airline utilizes a fleet of 339 mainline jet aircraft and 285 regional jet and turbo-prop aircraft connecting 195 destinations in North America, South America, Europe and the Middle East.This handcrafted model is painstakingly molded from pressure cast composite resin by our skilled craftsmen with a wealth of detail and makes a great gift for any veteran, aviation enthusiast or history buff.